Marine Scrubber Systems Market size is set to surpass USD 8 billion by 2024, as reported in the latest study by Global Market Insights, Inc.
Increasing sulphur emissions from shipping industry along with growing concern toward its adverse effects on health and environment will foster the marine scrubber systems market size. In January 2016, the IMO introduced global sulphur limit of 0.5% on fuel content in seaborne traffic that will be applicable from January 1, 2020. Growing legislative pressure on shipping vendors to meet environmental norms along with rise in clean fuel cost will positively influence the product adoption. Stringent government regulations coupled with penalties for non-compliance of SOx norms will boost the marine scrubber systems market. These devices are effective sulphur abatement technologies that removes particulate matters by over 70% and SO2 by 90%. High installation cost and rising adoption of clean fuels including Liquified Natural Gas (LNG) and Low Sulphur Fuel Oil (LSFO) may act as a challenge for the industry growth. The U.S. market will surpass 300 units by 2024. Ongoing research and innovations to manufacture technology in compliance with the new environmental norms will stimulate the industry growth. In addition, rising demand for retrofitting of existing vessels on account of stringent regulatory framework will encourage the product penetration. 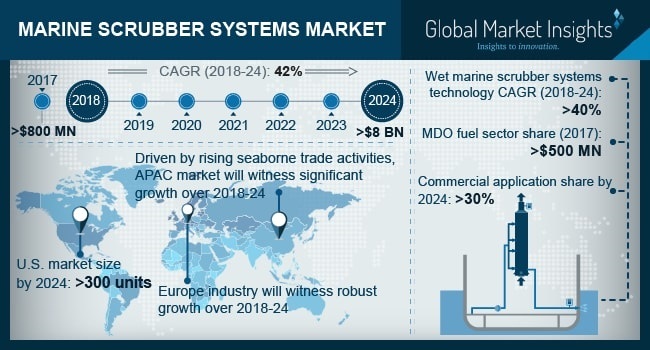 Upsurge in investments toward tourism industry on account of increasing disposable income, improvement in standard of living and demographic shifts will boost the demand for recreational marine scrubber systems market. According to World Travel & Tourism Council, in 2016 the marine tourism industry generated a revenue of USD 7.6 trillion contributing over 10.2% to the global GDP. Strict regulations to comply with 0.5% global sulphur cap along with high sulphur content levels in MDO fuel will positively influence the product demand. In addition, rising awareness toward marine pollution and introduction of technologically advanced systems including hybrid scrubbers will boost the global market outlook. Europe marine scrubber systems market is set to grow on account of increasing concerns toward limitation of sulphur emission rates coupled with rising investments across the maritime sector. Ongoing research and development (R&D) in product design and development along with presence of numerous manufacturers will strengthen the industry outlook. Further, the necessity for the big ships to report its verified annual emission data and other required information post 2018 will complement the product adoption. Growing shipbuilding industry coupled with rising maritime trade activities will positively impact the China marine scrubber systems market. Ongoing plans and investments to limit ship pollution through establishing new Emission Control Areas (ECAs) will further augment the product adoption. In 2015, the Chinese Ministry of Transport established new ECAs in the country including the Pearl River Delta, Bohai Bay, and Yangtze River Delta. Key industry players in the marine scrubber systems market include Yara, Wärtsilä, CR Ocean Engineering, Alfa Laval, AEC Maritime, DuPont, Clean Marine, Shanghai Bluesoul Environmental Technology, Fuel Tech, Mitsubishi, Johnson Matthey, GEA, SCL International, Scheuch Gmbh, Kwangsung, Albonair, FLSmidth, Damen, Ecospray Technologies and Fuji Electric.